This is a science-fiction book set in the distant future. In this book the people of the earth have found a way to portal from one planet to another. One in every few humans has an immune system that will not allow them to live anywhere but earth. These people are called apes, throwbacks, handicapped. This story follows one of these unlucky few. Her name is Jarra. 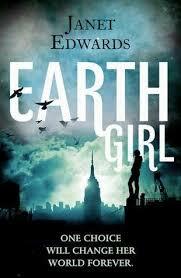 Jarra wants nothing more than to study the history of the earth and she has a plan. When a history class run by a college from another planet comes to excavate New York Jarra will study with them and try and pass as one of their own. Her intent is for them to accept her without knowing who she is only to throw it back in there faces to show them that they don't know 'apes' at all. But Jarra's plan becomes increasingly difficult as she gets to know the others. This book was definitely interesting. I found the different cultures from the different planets fascinating. It was interesting to see what passed as acceptable on some planets and how that could backfire. I definitely had some issues with this book. There were a few elements to the plot that I found very unbelievable. The main character Jarra, I feel, would be very annoying in real life. She likes to show off her knowledge and sometimes (cough, cough, OFTEN) makes stupid decisions. Saying that it was very entertaining to read and I am looking forward to continuing with this trilogy.